Hello! Yes, I am still alive, still recovering from my bilateral hip replacement but pretty much doing fabulously! I still have probably two weeks of physical therapy left and (being the Good Patient that I am!) doing my exercises daily and using my cane for another week. I’m trying hard to get out and get some walking in every day because my physical therapist tells me that’s important. The days that I am able to get extra walking in, I do feel better. Eventually, I will write a post All About the Adventure that was my surgery. In the meantime, I move along trying to feel like my old self. Part of that is getting back to blogging. I have missed it So Much!! I need to get a schedule set up for myself again and stick with it. What better way of getting back on schedule than joining in for What I Ate Wednesday hostessed by the lovely Jenn at Peas and Crayons? So here goes! My food offerings are somewhat random as you can probably tell from my title. Just a few tasty things, some of which I’ve saved for a few weeks, always intending to do a post! Ralph and I went out to breakfast on Tuesday morning. Right before going into the diner, I swore to myself that I would make a good choice, allowing myself to get back on track with my food. 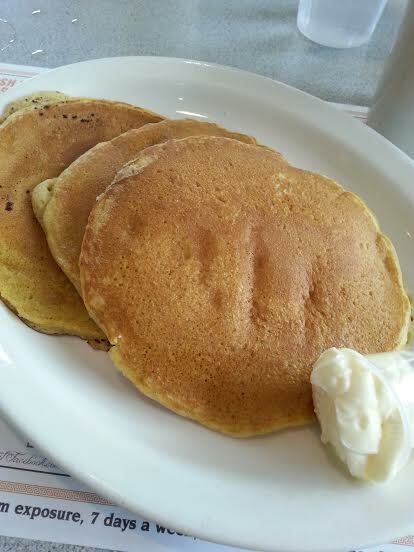 So of course, I ordered pumpkin pancakes! I did ask for the sugar-free syrup…Do I get points for that?!? 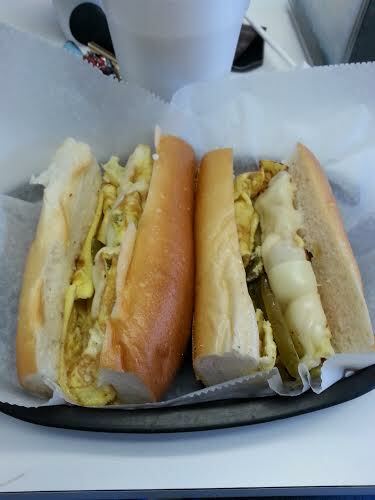 One of my all time favorites…pepper and egg sandwich with American cheese from our local pizzeria. I love this and it never fails to satisfy. Also, it always reminds me of my Mom. Good enough for me! Ralph and I went to a wonderful wedding for the son of close family friends. I was very happy when along with the usual meat and fish choices, the invitation offered a stuffed mushroom. Having no idea what that might be, I made that choice. Was I ever pleasantly surprised. The base was rice, then the Portobello, It was then stuffed with what I think was a tasty puree of white beans and wonderful herbs and spices. 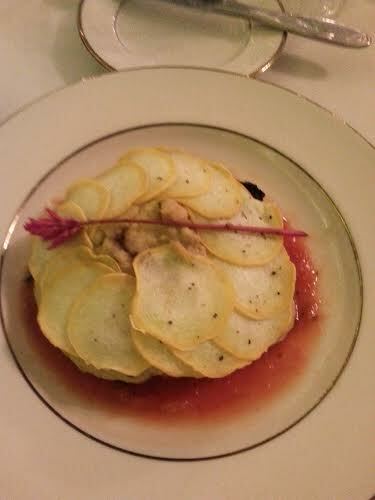 Topped with yellow squash although several people have said it looks like potato chips. No chips but it was Delicious and very filling. I loved it! Of course, it wouldn’t be BCDC without at least one salad. We have recently started going to a local Italian restaurant that we hadn’t gone to before. This is their Greek salad. 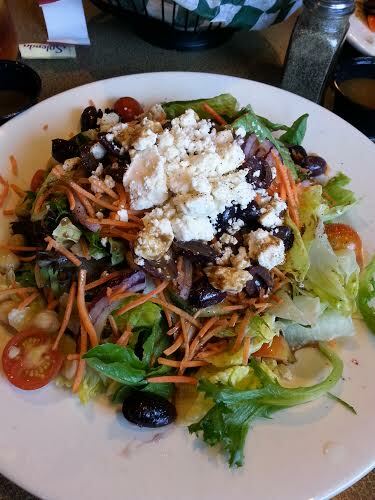 I love the combination of the greens, olives, tomatoes and feta. It’s a much more delicate Greek salad than some of the ones I get around here. It is just delicious. This restaurant has other good choices too, but I think this might be my favorite. Just typing up this post is getting me back into the feel of blogging. It’s not that I haven’t wanted to, I just haven’t had the enthusiasm for it. I feel that coming back. Maybe it’s the Fall. I always want to start something in the Fall. In this case, I’m re-starting something. The whole idea makes me happy! Be sure to stop over at Peas and Crayons to check out all of the other wonderful food and ideas that everyone is sharing. I know I will! This entry was posted in Uncategorized and tagged 1hip2hip, salads, Twice As Hip, vegetarian, veggies, WIAW. Bookmark the permalink. Thanks, Marjorie! It’s going really well!!! Just 2 more weeks of PT!! Wahoo!! Yup! Plus exercises at home every day. Have to find out how long I need to keep doing them at home. I don’t actually care, as long as it all works!! The mushroom dish looks great- I wish more weddings and gatherings would offer more Vegetarian choices!! Anna-Marie, you’re so right. I was really happy when I saw the choice on the invitation, but then I wondered what it might be stuffed with! I was so pleasantly surprised. Thanks for visiting! you can never pass up pumpkin pancakes!!! That is SO true! Thanks for visiting! So many yummies in this post! That stuffed mushroom as an option for a wedding dish is so intriguing, I would definitely order that just to try it. I was so glad to see the stuffed mushroom as a choice. Had no idea what it would be, but this was wonderful! It’s so nice to see you back and blogging Fran. I’ve been wondering about you. The salad looks awesome. I love a good Greek salad. The change of seasons and the start of Fall makes me want to nest. Weird, but true. Hey, Meghan! Thank you so much for your support through all of this. Yes, I’m back and I’m happy about it! Fall is my favorite, it’s time to start making soup! !